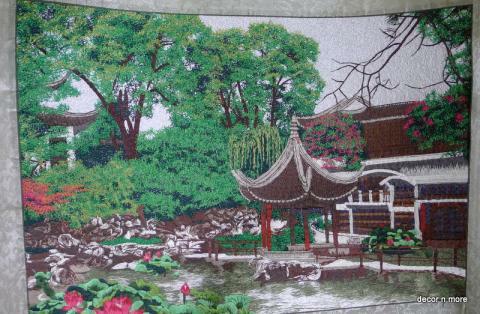 Bring a touch of the exotic to your living rooms with this embroidered wall hanging that shows a typical Chinese scene. Very intricate work, very finely done. Frame it and see just how stunning it looks on your walls! Available in different colors. This item in Home Decor category was first added to our catalog on 03-09-2014. Buy Embroidered chinese landscapes wall hangings, sold & shipped by Surya Enterprises where you can shop online for Fine Collection of Indian Jewelry & Accessories from Asia\'s Best. This Home Decor collection has been tagged as wall picture, embroidery,chinese landscapes, home decor.